Clearly, I am a focused driver. Why, you ask? Most Sundays, I drive down Concord Avenue in Cambridge, Massachusetts to get to our church on Brattle Street. T.W. Food is located but a stone’s throw away from Concord Ave. on Walden Street in the city’s Huron Village. I guestimate that in the seven years since T.W. Food opened, I’ve driven by it at least 200 times, probably more (my church attendance is a little light in the summer). Being a focused driver is my only excuse for missing this little gem. My friend Kathy and I enjoyed the most glorious meal at T.W. Food recently. Let me tell you about it. Opened in 2007, T.W. Food is owned by Tim Wiechmann (aka TW) and his wife, Bronwyn. Chef Wiechmann received his formal culinary education at Le Cordon Bleu in Paris in his early twenties. Returning to his native Massachusetts, he spent time at Aujourd’hui at Boston’s Four Seasons and later became Head Chef at Ten Tables in Jamaica Plain where he met Bronwyn, the restaurant’s opening manager. Together they returned to Paris where Tim apprenticed with an enviable list of mentors including Alain Passard of Arpege, Alain Soliveres at Taillevant (one of my favorite Parisian splurges) and Joel Robuchon at his Atelier. The objective of the Wiechmanns is to deliver “creative New American cuisine, enjoying the best ingredients in their ever changing seasonality”. Translated, the Wiechmanns strive to bring high quality and mostly locally procured ingredients to diners in the most creative way possible, incorporating the influences of their international travels, living experiences and mentors combined with their unique culinary perspectives. T.W. Food is a restaurant that celebrates culinary creativity without sacrificing the diner’s accessibility to the food. Waitstaff is extremely attentive and knowledgeable, and while the menu warrants questions, it does not need a culinary dictionary to decipher like some menus I’ve read lately. Our server, Laura was delightful, explaining menu offerings both before and after they were delivered to our table. We started our evening by selecting one of T.W.’s wines which are purposely few in number as they have been hand selected by the Wiechmanns to compliment their personal style of food. Our selection was a 2011 Chardonnay from Les Heritiers du Comte Lafon in the Bourgogne region of France. Reasonably priced, it was light and crisp. 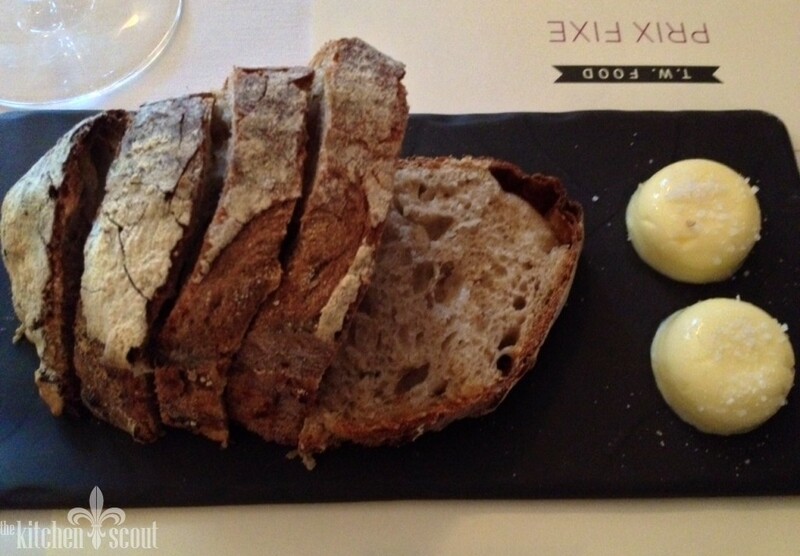 We were then served a sampling of the housemade sourdough bread accompanied by small rounds of room temperature unsalted butter with flakes of sea salt. Absolutely divine and an indication of the beautiful meal to come. T.W.’s menu changes nightly which speaks to the talent working in T.W.’s intimately sized kitchen. There are three ways to order your meal, all of which are pricey. A la carte ($17 for starters, $33 for mains and $11 for dessert); Prix Fixe which for $55 allows you to choose a starter, a main course and a dessert (and save $6); or, the Tasting Menu which consists of a six-course menu (either vegetarian or not or a mix) for $85. Kathy and I ordered a la carte and while it was expensive, the portions sizes were very reasonable. 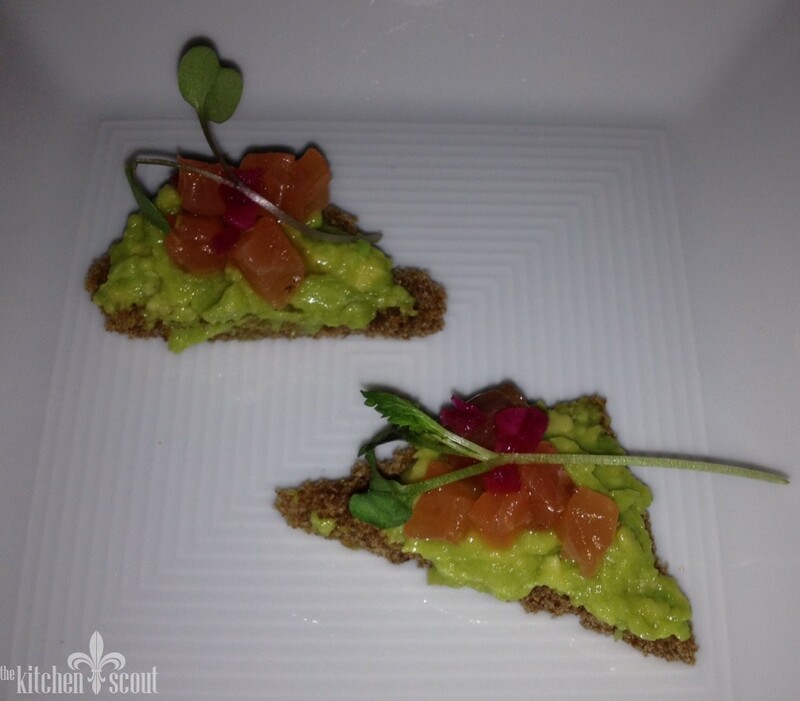 After we ordered our meal, we were surprised with an amuse bouche. I wish more restaurants would take advantage of this feel good, win-win opportunity with their patrons. Toasted pumpernickel with avocado and smoked salmon, two of my favorite ingredients. The perfect little bite while we waited for the main event. (I liked the combination so much, I subsequently made something similar for some friends). There were five starters to choose from and we ordered three to sample. We selected the Panna Cotta. Usually a sweet dish, this panna cotta (cooked cream) consisted of two savory layers, one brightly flavored with fresh ginger and the other with spring peas. Garnished with a generous sprinkling of mangalitsa ham, the dish was served with more of the housemade bread and was a refreshing and unique twist on the traditional. The creamy layers complemented each other and were balanced out by the salty ham. Our next starter was an item that I believe has been on the menu since T.W. Food opened. 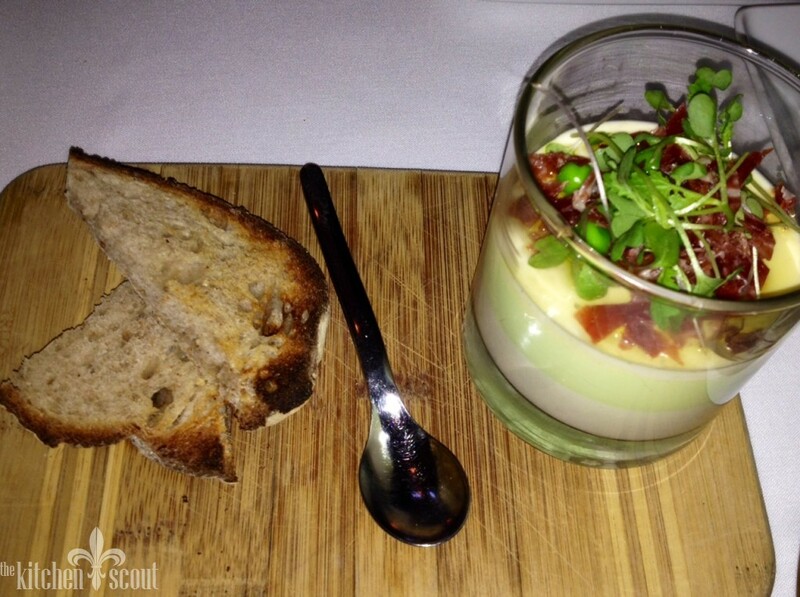 This dish was a fois gras creme brulee served with pickled green almonds, apple and lightly toasted challah bread. There is a reason this has been on the menu as long as it has. It was outstanding. Crazy good! 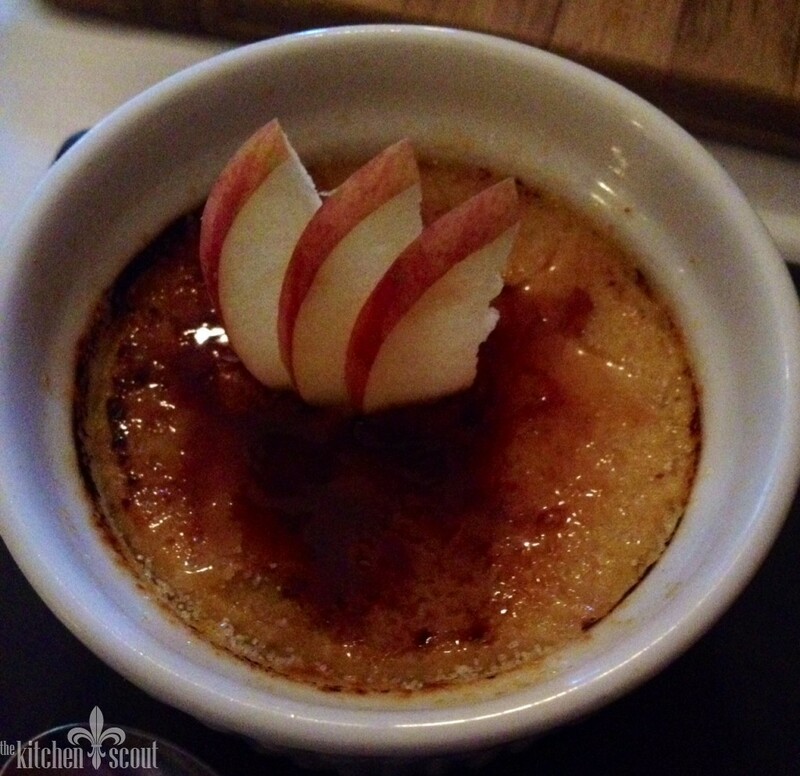 The sweet brulee topping cut through the richness of the creamy fois gras mousse lying beneath it. Our third starter was a little disappointing. We ordered mussels which were served with yogurt, za’atar, chickpea panisse and preserved lemon. The mussels were cooked well and were tasty, but we didn’t feel the flavors came together well in this dish. 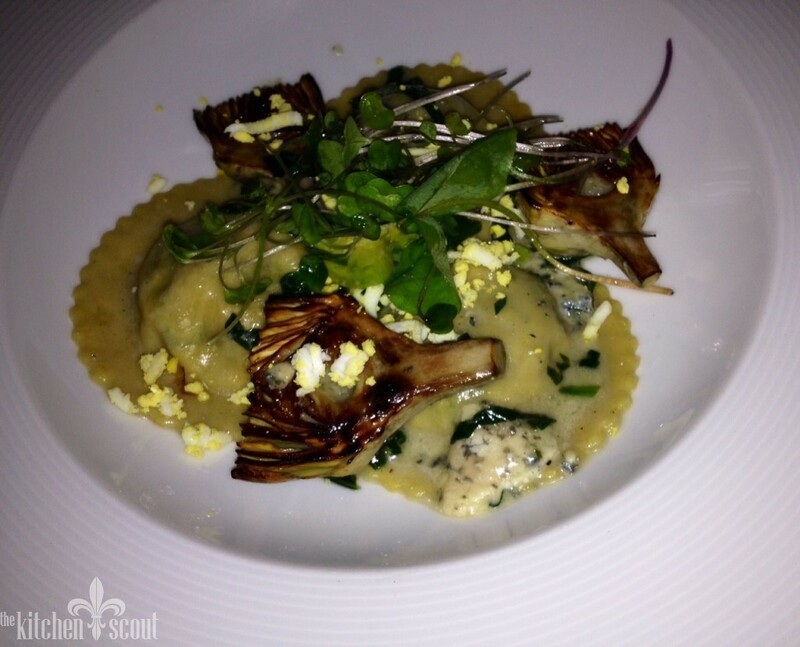 There were also five main dishes to choose from and we started with the Raviolo. Tender pasta stuffed with the mild French blue cheese, Fourme d’Ambert was accented with porcini mushrooms, charred baby artichokes, fava leaves and grated egg. The dish balanced flavor and textures beautifully and was completely satisfying. Also, the portion size was very generous. We also ordered the bavette steak which is a cut similar to flank or skirt steak that usually has an intense meaty flavor and delicate texture. 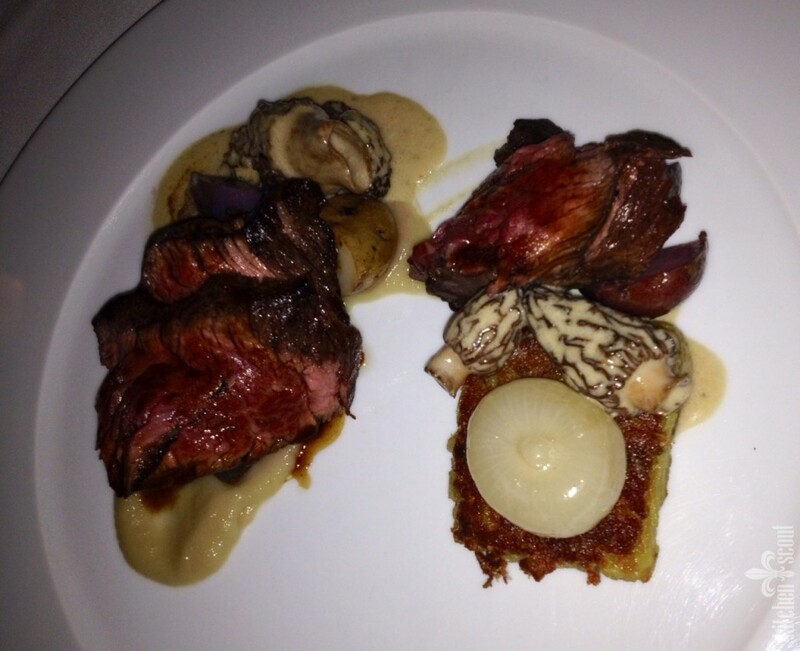 The steak was accompanied by both a potato cake and some purple potatoes, vidalia onion, morel mushrooms and finished with a reduction sauce enhanced with cream. One bite exploded with flavor. The meat was incredibly tender and could almost be cut with a fork. The potato cake was perfectly crisp and there were just enough morels to accent, but not overpower the dish. This would be an entree worth coming back for on its own. Other entree choices were a Pomegranate braised Lamb Shank with ricotta gnudi, a “Noodle” dish with scallops, and clams and a Tuna with white asparagus, avocado and pineapple. Even though Kathy and I were pretty full, we couldn’t pass up all of T.W. Food’s six dessert offerings which included a cheese course, a selection of sorbets, a gateau (cake) traditional to the Basque region of France, beignets served with tobacco ice cream, and the T.W. chocolate sundae. 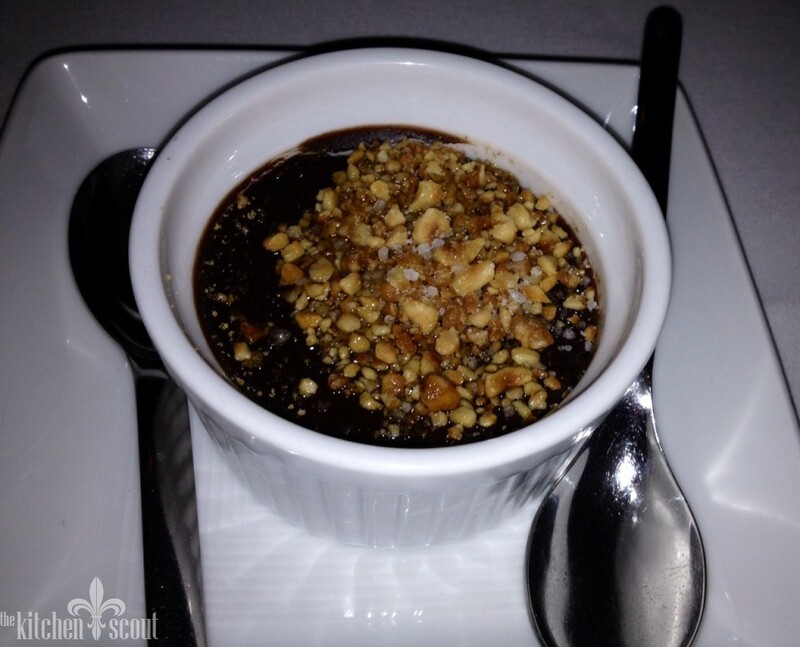 We chose the budino which was a custard made with Valrhona dark chocolate. Topped with candied hazelnuts, sea salt and olive oil, it was smooth, creamy and positively delicious. We ended our meal with French pressed coffee that was so good we both commented on it and asked our server what it was. Turns out it was Karma coffee which is roasted locally in Sudbury, Massachusetts. (I went the next day and stocked up on their Brazillian coffee – full body, nutty). Laura also brought us two petite financieres to go with our coffee. While T.W. Food’s decor is what I would call minimalist, the Wiechmanns discuss on their website that they have taken great care to choose the silverware, china and stemware to enhance the dining experience. The care in those details definitely shows and gives you the sense that you are in someone’s home, rather than a restaurant. T.W. Food is an intimate restaurant with seating for about 28 people at 10 tables and I think it’s a perfect place for a quiet dinner with a close friend or companion. The food is luxurious and slow (in a good way) and the ambiance is perfect for a break from the chaos and bustle of some larger establishments. I think the fact that the restaurant does not have a bar plays into its intimacy – people truly come to dine. The Wiechmann’s opened their second restaurant last year featuring “the cuisine of Germany and greater Central and Eastern Europe”. Aptly named Bronwyn, it is located in Somerville’s Union Square. Can’t wait to give it a try!